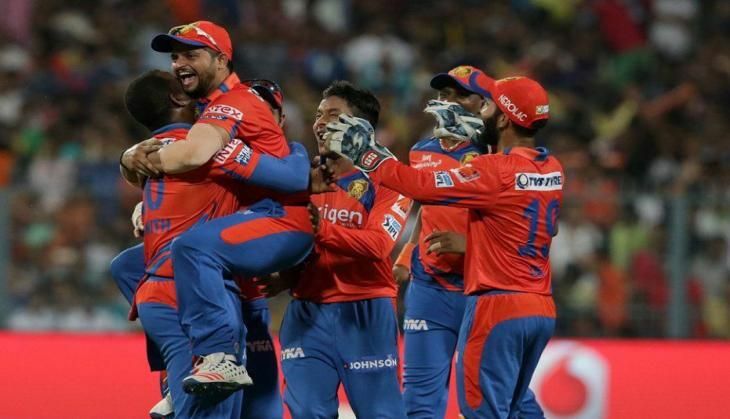 After suffering three consecutive losses, the Indian Premier League (IPL) debutants Gujarat Lions registered a comprehensive five-wicket win over Kolkata Knight Riders (KKR) to take the top spot in the points table. Asked to bat first, hosts Kolkata slumped to 24/4 in the powerplay overs following an exemplary bowling performance from Praveen Kumar (2-19) and Dhawal Kulkarni (1-30). The duo made full use of the conditions, swinging the ball under overcast skies to inflict early damage on the opposition. However, a crucial 134-run partnership between Yusuf Pathan (63*) and Shakib Al Hasan (66*) propelled the Gautam Gambhir side to a competitive total of 158 runs. Pathan played his natural attacking game and clobbered the opposition bowlers for seven fours and a six in his 41-ball innings. His partner Shakib, on the other hand, was slow off the blocks before switching gears in the death overs. The Bangladeshi all-rounder hammered four fours and four sixes in his knock of 49 deliveries. Set to chase 159, Gujarat got off to a breezy start with both Dwayne Smith (27) and Brendon McCullum (29) looking in good touch early on. The duo had added 42 runs for the first wicket before Shakib dismissed Smith in the sixth over to provide a vital breakthrough to Kolkata. Piyush Chawla followed in the footsteps of Shakib and got rid of the dangerous McCullum in the eighth over to bring his side back into the contest. With the visitors reeling at 67/2, Suresh Raina (14) and Dinesh Karthik (51) stitched a 49-run partnership to steady their run-chase. Their partnership was finally broken by Andre Russell who got Raina caught in the deep by Brad Hogg in the 14th over. Despite the fall of his skipper, Karthik continued to play his strokes and notched up his third half-century this season - most by a player batting at the no. 4 slot or lower down the order. Aaron Finch (10-ball 29) also looked in explosive form until he was run-out by Manish Pandey after a horrible mix-up with Ravindra Jadeja (9*) in the 18th over. The victory was sealed by Jadeja who bludgeoned Chawla over deep midwicket for a towering six in the same over. Kolkata's total proved to be a bit too low in the end as the opposition managed to achieve the target with 12 balls to spare. Russell (1-21), Shakib (1-38), Chawla (1-30) and Hogg (1-19) were all amongst the wicket-takers for the hosts. The victory has now powered Gujarat to the top spot with 14 points, accumulated after seven wins in 11 matches. On the other hand, Kolkata are at the third spot after suffering their fourth loss in 10 games so far.